June 28: [1873, Yedo, now Tokyo] Raining, raining. A long long walk with Mr. Thompson. Oh! even to you, my diary, I cannot think to utter it. How much the heart may contain—what burdens the soul may bear!—Who knows how through all the light may dawn! It is safe in God’s keeping. June 30: Rainy. In the after-noon a talk with Mr. Thompson.—Let the veil fall! Much in all these matters about which I have not reasoned, and much about which I cannot reason. Only the Good Master guide me whether it be to pain or pleasure. I felt very happy and safe this afternoon.—Letters come, but none from home….Miss Youngman comes, I suppose. A little dread at thought of our relations. I pray for grace. God keep my hand in thine. July 6: Saturday evening. So much of interest and yet not a word told you, my diary. –Thurs, 3rd Miss Youngman came to visit us. Brought me letters, but little news.…Today writing in the fore-noon and talking to Miss Youngman. I hope the way will be made plain to us both. My heart is quiet and peaceful and happy…. O, I am most intensely thankful. I could not be boisterous….I wish I were sure that her heart is at rest, fixed. I shall try to think only well of her. Mrs. Carrothers and I took her to the depot after lunch, and I hope she has made the journey [back to Yokohama] safely. We then went on in our mission, calling upon O Ino San, O Yoki San, Mrs. Dunn, and O Kobayashii San. We, of course, drank tea and ate fruit with the kind Japanese friends, and carried home presents from them….After six when we got home….The way has been open to act selfishly, but I have desired not to do so. The dear Father in Heaven can be very near in Japan. July 8: Another long walk with Mr. Thompson. O Father in Heaven, dear Father in Heaven, what awful revelations,—what more, awful revelations, shall be made to me next! Protect me, hide me under thine Almighty wing! Shall I with fear and dread sink away into nothingness! O lift me up-lift me up forever! July 9: Mr. Thompson always so tender and thoughtful. I think he feared I would feel depressed after our talk last evening. He wanted to send in his teacher two hours each day to instruct me. Perhaps this would be perfectly right, but I could not agree to it. After dinner, a long walk to book-stores in search of helps in the way of Japanese books. Our talk strangely mingling the matters of this world—our prospects in this world and that other. Our proposed times of recreation talked over too. Ah! the veiled future, cloudy or bright, we know not,—but the future beyond,—near it may be, and at most, not far—is resplendent in glory and brightness. July 12: Have payed Mr. Carrothers for my board the last two months. He charges me twenty-four dollars per month, and I am to furnish my own room as soon as I can. Even[ing]. singing and marching with the Japanese girls on the upper verandah. They seem much amused at our plays, but readily fall in with our stepping to time.—Looking over—with Mr. Thompson—the line of the Journey he is to begin next Monday. A pleasant talk, and full of hope for Japan. Takahashi had sent him a letter asking to be baptized. July 13: Mr. Carrothers sent O Mino [a servant] away this morning. I could not help feeling sorry for her. I gave her a little extra pay and a pretty little card with the second Commandment on it. O how I wished to say, Be a good girl and learn to love our God. I have prayed that this card as well as the Gospel I gave her may prove an eternal blessing.—Dreary, rainy days, but I am so comfortable, and have so much to love and be thankful for. The time passes in peace. And yet, I stand in a critical place. God shield and help me. Give me strength and wisdom and most abundant peace. With a thankful heart I ask this. I would be more than ever entirely thine. O, I would set up in my heart no idol, but only take into it dear helps to serving thee. Lead me by the hand, my Father, in thy path, not mine.–even[ing]. Sorry at thought of my conduct with Mr. Thompson—weakly and with want of dignity. For relief, when he was gone, I came in here and fell on my knees and asked the heavenly Father’s pardon and help to do better in all the future. I feel soothed and lightened. 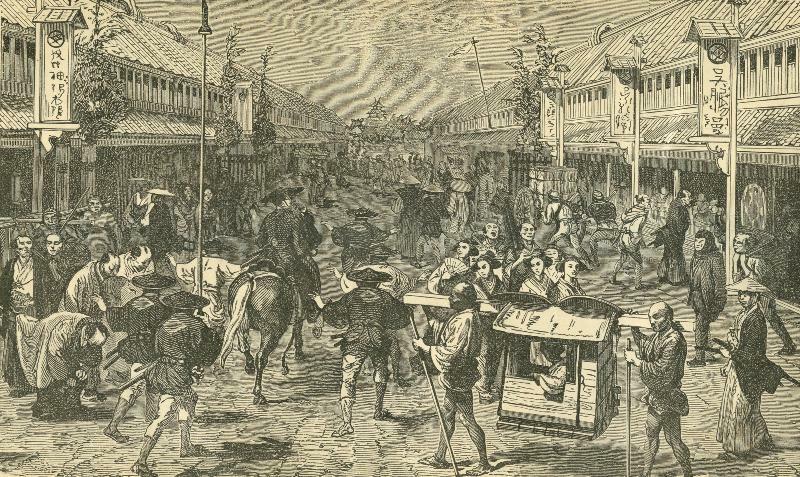 “The City of Yedo,” from The Foreign Missionary, containing particular accounts of the Foreign Missions of the Presbyterian Church, v. 34, Sept. 1874, p. 97. July 14: A windy Sabbath day. Part of a sermon read by Rev. Dr. Herder. A pleasant proper talk with Mr. Thompson this afternoon. The wind and the surging sea make strange portentous sounds, some such sounds as I think will accompany the final winding up of all things. July 14: Mr. Thompson started on his journey this after-noon. Ah, how I thank God for him, so pure, so true, so loving, so wholly to be trusted. And I do so wholly trust him. I wonder but can by no means explain all this to myself. The dear Father prosper and guard and bless him. Jesus, our brother, Holy Spirit, our Comforter, let not his hours be lonely, but fill them with cheering, hopeful sights and sounds, and with blessed, life-giving thoughts that shall soothe and make strong. Guard him most tenderly. July 16: Bishop Harris and several other Methodist brethren calling.—Even[ing]. Miss McClain came.—A fuller prayer meeting than usual, but I missed Mr. Thompson. He was scarcely spoken of by any one. This left me quiet to think of him all the more frequently, and to pray that all good might surround him. July 17: These days are bright, but very warm. Is Mr. Thompson weary with his journey, or comfortably resting tonight? July 18: A journey round this afternoon with Mr. Carrothers for the purpose of trying to find some furniture for my room. Not a great variety. Made some little purchases though. I am resolved to make efforts to get on among the Japanese alone, so that I may not be burdensome, and also, that I may learn the language. July 19: A whole warm day spent in visiting and I am tired enough. July 20: Mr. Thompson is in the mountains today, if all is well. He has doubtless communed with God. Perhaps at this evening hour, in wrapt frame, he talks with God as a man with his friend. Dear Heavenly Father, in thy love and might, stay near him.—I hope he has been rejoiced by being able to preach an effective sermon to some dark soul or souls today. July 26: Sat. even[ing] A little review of the week, so full of interest to me. Mon. 21st school, preparations for going to Yokohama, letter writing, a frightened walk in search of Mr. Edkin’s hotel. Tues. 22nd. Went on the 8 o’clock train to Yokohama. Was fortunate enough to find Dr. McCartey for company. He told me many things of his mission work in China that profit me. I learn better what to expect among missionaries. Tares and wheat  as among every other class of professing Christians. Pleasantly received at Mr. Loomis’. Miss Y[oungman] and I made some purchases in the afternoon. Wed. 23rd. Talking to Mrs. Loomis,—making sponge cake for them and Mr. Miller—Delayed to go to Mrs. Pruyn’s as I promised till it was too near dinner time.—In the after-noon, hindered and hindered from going till late. Miss Y. with me.—Did not get back in time for the six train—pressed to stay—thought I should not. Had to come on the seven train—frightened about this, but all came well….Very tired, but satisfied with the thought of how much I accomplished in Yokohama, having made arrangements for the making of my furniture, etc. Thurs. 24. Mr. Thompson returned in the afternoon, a day sooner than we expected him. In the even[ing] after Mr. Edkins, etc. who were here for dinner, were gone, a quiet pleasant talk and a rehearsal of the incidents of his pleasant profitable journey.—not noisy, but so deeply, wholly glad at seeing him again. Fri. 25th. The last day of my school. Some of the boys said, “very sorry.” And I suspect that one little lazy one was glad that the burden of coming through the warm sun was removed….After dinner, started to take a long walk with Mr. Thompson. On returning, caught in a shower and completely drenched. The jinrikisha that brought us home was little protection only our feet were kept out of the mud. Sat. 26th. Such long continued heat! A long time cleaning my room, fixing boxes and drawers and rubbing the mould (sic) off articles. Made a church hat for myself in the after-noon. Even[ing]. The opening of the river ceremonies. We walked back and forth on the beach, back and forth on the verandah with much enjoyment. A brilliantly illuminated boat and some little sky rockets in the distance were all that we saw to make us think of a festivity. July 27: Just three months since I came to Japan, and on Sabbath too. O, I fear I have not improved as much in the language as I should, and scarcely my fault either. I have at least been wakened to the knowledge of many necessary though painful facts, and, O, dear Heavenly Father, to the knowledge of happy, precious ones too. Thou dost never make the cup more bitter than is needful. Thy bounteous blessing follows me here. Keep me ever shadowed by thy wing. Let me not try to go out into the world’s rough glare and be scorched. July 28, 1873: North Room, Home of Mr. Carrothers, Yedo, Japan. With Mr. Thompson my last book ended, with him this one begins. This evening spent with him. Is our affection excessive, we sometimes ask, and yet, we both cannot but think that God guides us, and that he would have us thus love each other. Mr. Thompson says there are two ways, either great happiness or great pain is in store for us—and we wait. It would be well either way, for God does all well, but he only knows how now we could endure separation. I borrow not trouble, but daily bless the Compassionate Father for such a noble, perfect friend, and would live nearer the Throne in gratitude for the gift. The Presbyterian Historical Society received the Thompson Papers in 2011, a collection that includes Mary Parke Thompson’s seven handwritten diaries. PHS volunteer Sue Althouse, herself a retired missionary to Japan, has been processing the Thompson Papers, and she has chosen excerpts from Mary’s diaries to share with readers. To see other excerpts, visit http://www.history.pcusa.org/about/blog  and select the Mary Parke Thompson tag from the right hand menu. Posts will then be displayed in reverse chronological order. Presbyterian missionary Kate M. Youngman, who served in Japan from 1873 until her death in 1910. Former Presbyterian missionary Dr. D.B. McCartee. He resigned from his post in the PCUSA’s Ningpo Mission (China) in 1873. Presbyterian missionary J. Rothesay Miller. Mary Putnam Pruyn went to Japan in 1871 under the auspices of the Woman’s Union Missionary Society of New York City. 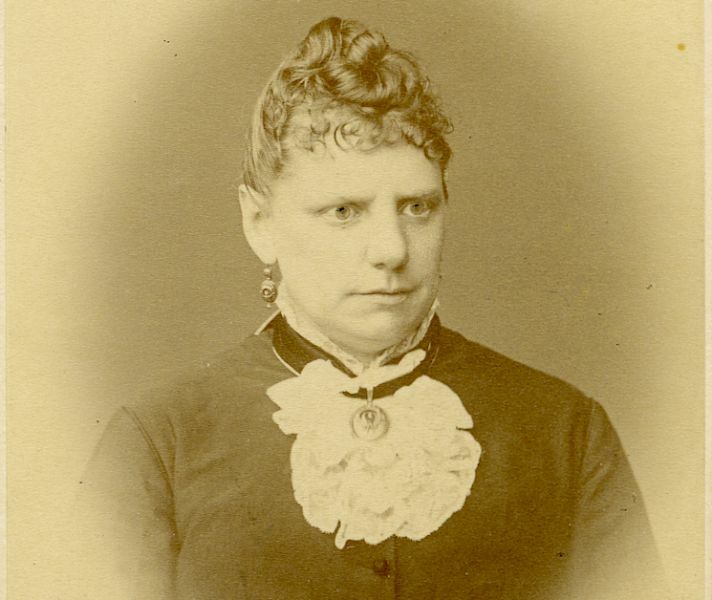 Mrs. Pruyn founded a girl’s school in Yokohama.